or drop-in for $10 a class. Please note that payment is not refundable if students to not show up at the workshops. December, 2005 - MEAC student show (more information coming soon). Sept 17th or 18th, 2005 - Tribal Vibes performance at Garlic & Arts Festival. July 2nd, 2005 - Dancing Dragon's Grand Opening Party. 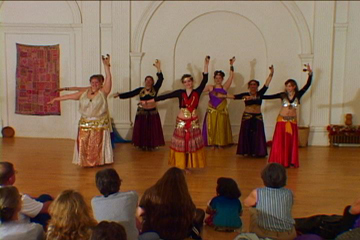 June, 2005 - MEAC Student Show at Karuna Yoga. Would you like to perform "tribal" with an amazing group of women? If so, please come to the rehersals and be a current student of Mellea (Whitney). Rehearsals are not classes and are free. Contact Whitney at 413-774-5589 to learn more. We are preparing for our next performance and Kallista (aka Tribal Vibes) troupe members are needed at the following rehearsal dates to prepare.